AAUP Opposes Academic Boycott, But Who Cares! Four professional associations have already voted to boycott Israel academically. The American Association for University Professors (AAUP) does not approve of this form of protest, but does it have any teeth? Can it do anything to get their members to bring down this despicable trend to muzzle academic freedom supposedly in the name of promoting academic freedom? On 10 May 2013, less than one month after the Association for Asian American Studies (AAAS) approved the very first resolution in the USA to boycott Israel academically, the American Association for University Professors (AAUP) published a statement clearly opposing the use of academic boycott. This did not prevent the American Studies Association (ASA) from passing a boycott-Israel resolution in December 2013, nor the American Anthropology Association and the National Women’s Studies Association from doing so in November and December 2015, respectively. The former still has to be ratified by the entire membership in spring 2016, but the direction seems clear so far. Other associations have declared their intentions to jump on this bandwagon to degradation of free speech and scholarship. The AAUP expressed clear dissatisfaction with the AAAS boycott resolution, stating that individual professionals have, of course, the right to refuse to cooperate with peers or institutions with which they have political and ideological disagreement even if these disagreements have no bearing on research, teaching or field work. The AAUP says it is not in the business of dictating individual actions of its members; it IS in the business, however, of recommending that ASSOCIATIONS not partake in coordinated efforts to bully their colleagues for reasons unrelated to their specific professions. The important terms here are “selective”, “political” and “religious”. I don’t think anyone would like to see universities judged on the basis of the political and religious allegiances of their institutions, Jewish, Catholic, Muslim or otherwise. However, even if the professional associations were less selective and were boycotting academic institutions in the full range of countries where humanitarian rights and academic freedoms are being violated, academic boycotts would still be wrong. Humanities and Law Professor Stanley Fish claims that universities are not in the business of human rights activism or the advancement of international justice, but in the business of scholarship, research and education that may provide the relevant professionals in government and non-government agencies whose job such things ARE with the knowledge they need to perform their tasks well. Consistent with our long-standing principles and practice, we consider other forms of protest, such as the adoption of resolutions of condemnation by higher education groups intended to publicize documented threats to or violations of academic freedom at offending institutions, to be entirely appropriate. Here the key phrase is “documented threats to or violation of academic freedom”. The boycott-Israel statements and resolutions voted upon by association members contain empty regurgitated platitudes and accusations that are general in nature and not backed up by provision of specific examples or by data. Recognizing the existence of shared concerns, higher education groups should collaborate as fully as possible with each other to advance the interests of the entire academic community in addressing academic freedom issues. Such collaboration might include joint statements to bring to the attention of the academic community and the public at large grave threats to academic freedom. This seems to be too insipid for professors who want to be on the front lines of social change as the intelligentsia has been for centuries. In spite of the clear declaration on the part of the AAUP that academic boycotts are not appropriate for academicians whose very foundations are built upon collaboration rather than excommunication, the other associations named above followed the AAAS down the yellow brick road. After the 2013 ASA approval of academic boycott against Israel, the AAUP again published a statement (copied in the Appendix below) expressing their disappointment and dismay. I guess nobody cares what the AAUP thinks. Looks like members of the AAUP are only in the organization for what they can get from it – such as interventions when your faculty rights have been violated and a wide variety of insurance plans at reduced rates – and not for the principles that guide it. On Friday, May 10, 2013 this AAUP issued the statement below. The recent decision by noted physicist Stephen Hawking to call off plans to attend a major conference in Israel out of deference to an academic boycott advocated by some pro-Palestinian groups and the vote in late April by the membership of the Association for Asian American Studies to endorse such a boycott have again raised the issue of whether such boycotts violate the principles of academic freedom. 1. In view of the Association’s long-standing commitment to the free exchange of ideas, we oppose academic boycotts. 2. On the same grounds, we recommend that other academic associations oppose academic boycotts. We urge that they seek alternative means, less inimical to the principle of academic freedom, to pursue their concerns. 3. We especially oppose selective academic boycotts that entail an ideological litmus test. We understand that such selective boycotts may be intended to preserve academic exchange with those more open to the views of boycott proponents, but we cannot endorse the use of political or religious views as a test of eligibility for participation in the academic community. 4. The Association recognizes the right of individual faculty members or groups of academics not to cooperate with other individual faculty members or academic institutions with whom or with which they disagree. We believe, however, that when such noncooperation takes the form of a systematic academic boycott, it threatens the principles of free expression and communication on which we collectively depend. 5. Consistent with our long-standing principles and practice, we consider other forms of protest, such as the adoption of resolutions of condemnation by higher education groups intended to publicize documented threats to or violations of academic freedom at offending institutions, to be entirely appropriate. 6. Recognizing the existence of shared concerns, higher education groups should collaborate as fully as possible with each other to advance the interests of the entire academic community in addressing academic freedom issues. Such collaboration might include joint statements to bring to the attention of the academic community and the public at large grave threats to academic freedom. 7. The Association recognizes the right of faculty members to conduct economic strikes and to urge others to support their cause. We believe, however, that in each instance those engaged in a strike at an academic institution should seek to minimize the impact of the strike on academic freedom. 8. We understand that threats to or infringements of academic freedom may occasionally seem so dire as to require compromising basic precepts of academic freedom, but we resist the argument that extraordinary circumstances should be the basis for limiting our fundamental commitment to the free exchange of ideas and their free expression. In light of these principles the AAUP recognizes the right of individual scholars, including Prof. Hawking, to act in accordance with their own personal consciences. No scholar should be required to participate in any academic activity that violates his or her own principles. In addition, faculty members have to right to organize for or against economic boycotts, divestment, or other forms of sanction. However, an organized academic boycott is a different matter and we are disappointed by the resolution of the Association for Asian American Studies and would instead urge that organization and its members to find other means to register their opposition to Israeli policies. The American Association of University Professors (AAUP) is disappointed in the vote announced this morning by the membership of the American Studies Association (ASA) to endorse an academic boycott of Israel. While the AAUP takes no position on the Israeli-Palestinian conflict, we have opposed all academic boycotts in principle since 2005 when we published our report On Academic Boycotts. While the ASA vote was underway AAUP president Rudy Fichtenbaum and first vice-president and Committee A chair Henry Reichman issued an Open Letter to ASA members urging defeat of this boycott resolution. We note, however, that while nearly two-thirds (827) of the 1,252 ASA members participating in the vote supported the boycott proposal, less than a third of those eligible actually voted. The ASA resolution also limited the boycott to ASA’s own organizational contacts with Israeli institutions, exempting individual scholars. Since these contacts are surely limited, the resolution may have less effect than some supporters claim. This limitation may also help explain the turnout. Nevertheless, the vote represents a setback for the cause of academic freedom. In announcing the results of the vote, the ASA also announced “plans to bring Israeli and Palestinian academics to the 2014 national convention in Los Angeles.” It is reasonable to ask, however, how the ASA will respond if the travel of those scholars is funded by any of the Israeli universities being boycotted. Will those invited be barred from receiving institutional funding? Will there be in effect a political litmus test limiting those invited to supporters of the ASA resolution and its characterizations of academic freedom and Israeli policies? The broader impact of this vote should not be exaggerated. 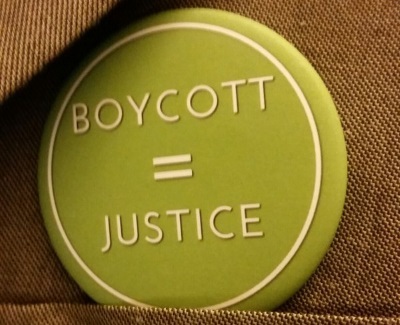 Since the AAUP adopted its position opposing academic boycotts over eight years ago, only two scholarly associations, the Association for AsianAmerican Studies and the ASA have endorsed an academic boycott of Israel. The ASA has fewer than 4,000 members and the AAAS is even smaller. No other disciplinary association, including the Modern Language Association, the American Historical Association, the American Economic Association, the American Mathematical Society, the American Political Science Association nor any other area studies association or similar professional organization, including no union of academic employees, has endorsed or even considered endorsing this boycott. Support for academic boycotts therefore remains the position of a small minority of college and university faculty. It will be up to those members of ASA who support the principles of academic freedom to decide for themselves how to respond to this decision. But we can say that the response suggested recently by former Harvard University President Lawrence Summers, that universities deny travel support to faculty attending ASA meetings, would only compound the violation of academic freedom. For our part, AAUP will continue to oppose all academic boycotts and urge supporters of those boycotts to find other means to register their opposition to policies they find abhorrent.